As Swedish society becomes increasingly multicultural, the once-homogenous Sweden is forced to tackle a number of previously unencountered problems. To parry the ensuing dangers of multiculturalism, the Swedish government has unveiled a national plan against racism and similar forms of hostility and hate speech. In its new plan, the Swedish government aims to focus on five strategic areas, including education, research, co-ordination and monitoring. According to Culture and Democracy Minister Alice Bah Kuhnke of the Green Party, civil society must play a central role in the fight against racism. Today, there are five officially recognized national minorities in Sweden: Jews, Roma, Sami, Swedish Finns and Tornedalians (descendants of Finns in northern Sweden). According to Bah Kuhnke, however, other minority groups have complained about the lack of dialogue. "They have felt neglected and therefore we will now formalize the dialogue," Bah Kuhnke said, as quoted by Swedish newspaper Dagen. She also pledged to focus on Islamophobia and Afrophobia. ​In Sweden, Islamophobic hate crimes increased by 105 percent from 2011 to 2015, according to recent statistics from the National Crime Prevention Council (Brå). During the same period, Sweden's Muslim community grew considerably, with the number of practicing Muslims hovering at 500,000 in a nation of roughly 10 million. "The overall picture indicates a particular concern among girls and women who wear headscarves and other Islamic garments," Imam Ahmed Dahir of Västerås Mosque told Swedish Radio. According to Bah Kuhnke, particular efforts should be also undertaken against homophobia, transphobia and biphobia. "Racism is a huge obstacle for running a proper society. We must actively and strategically combat racism in Sweden," Alice Bah Kuhnke said, as quoted by Dagen. According to Bah Kuhnke, this is the first time the Swedish government has taken a comprehensive approach to the fight against racism and hate speech on the internet. "In an era of polarization and increased inequalities between people in our country, it is our duty to stand up for a society of diversity and respect for each other," Alice Bah Kuhnke said, as quoted by Swedish newspaper Linköpings Nytt. Additionally, the government gave the law enforcement system a clear signal to prioritize the issue of hate crimes. This may prove a hard task to deliver for Swedish police, which has of late been suffering from understaffing, underpayment and the lowest percentage of crimes solved in years. Nevertheless, Interior Minister Anders Ygeman pledged to strengthen the capacity in this area. 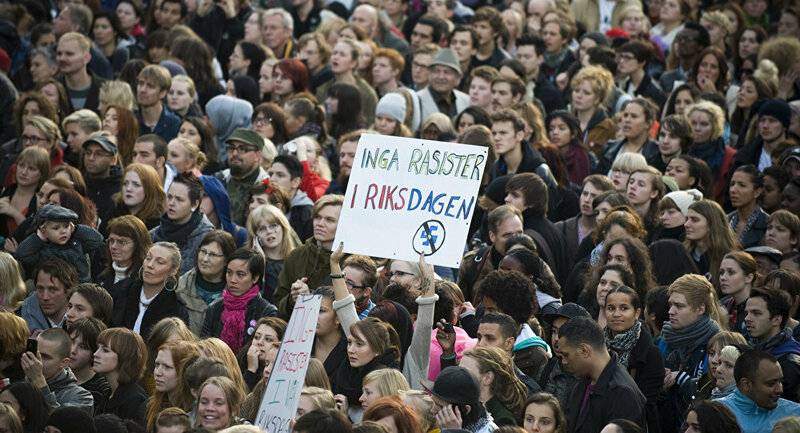 Combatting racism and hate crimes has been one of the top priorities for the Swedish red-green coalition government, which describes itself as "overtly feminist." During its tenure, the Swedish government has spent an extra 156 million SEK ($17mln) on the eradication of racism and hate speech. In the draft budget for 2017, an extra 40 million SEK ($4.5mln) was allocated. Among other things, fears were expressed that the Swedish crackdown on racism may hit hard the country's few "dissident" independent media that express discontent with the government's immigration policy. Ironically, Sweden's largest daily newspaper Dagens Nyheter, which usually functions as the government's mouthpiece, recently came under fire for alleged anti-Semitism for publishing a caricature of US President-elect Donald Trump and Israeli Prime Minister Benjamin Netanyahu being borne in a palanquin by Ku Klux Klan members together with Orthodox Jews. ​"The evil that is anti-Semitism which screams out from this cartoon would evoke tears of joy from Nazi Propaganda Chief, Julius Streicher," Rabbi Abraham Cooper, Associate Dean of the Simon Wiesenthal Center, said.